An inguinal hernia is a protrusion of the contents of the abdominal cavity into the inguinal canal, which is located in the groin. It appears as a bulge into groin, or into the scrotum. 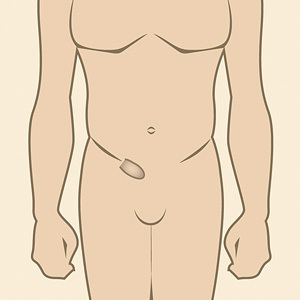 Inguinal hernias occur more often in men, because the inguinal canal is larger in males, making the wall naturally weaker. This can commonly be referred to as a testicular hernia in men. But women and girls can also experience this type of hernia as well. The expert surgeons at Hernia Center Los Angeles are some of the top hernia surgeons performing inguinal hernia repair in Los Angeles & Beverly Hills and will ensure that your hernia is properly diagnosed and treated. Sometimes a baby boy is born with an inguinal hernia. This happens because, as the baby develops, a muscle ring opens up on each side of the groin to allow the testicles to descend into the scrotum. This channel closes in most boys once the testicles are in place, but if it doesn’t, a portion of the intestine can pass down the channel, resulting in an inguinal hernia. Men are more likely to develop inguinal hernias because they have a greater likelihood of weakness in this portion of the abdominal wall than women. What procedures are available for my inguinal hernia repair & surgery? The best inguinal hernia repair & surgery for you will depend on the exact nature of your hernia. In men, inguinal hernias are usually repaired using an expandable mesh system that prevents the hernia from recurring. The surgical mesh “plug” allows the necessary tubes and nerves to move through the canal, while preventing the bowel from doing so. It’s carefully placed so that it expands and contracts with exercise or strain, so that you can easily resume your normal routine without pain, and without danger of the hernia recurring. What if my child has an inguinal hernia? In a baby, an inguinal hernia is a defect in the inguinal canal, and it needs to be repaired so that your child will grow up safely and naturally, without danger to his or her bowel or reproductive system. You should schedule a consultation with our pediatric hernia surgeon, if you or your pediatrician notice a lump in your child’s groin or scrotum. In a child, the procedure is usually very simple. The intestine is placed into its correct location, the hole is closed with sutures, and the tissues grow back together as the child grows. When our pediatric hernia specialist repairs an inguinal hernia in a child, he will always examine the other side laparoscopically to make sure that there is no defect on that side as well. If you are in need of inguinal hernia repair, don’t wait. Have it repaired on your own schedule, in our comfortable surgical facilities in Beverly Hills. You don’t want to let it turn into an emergency situation. Contact the Hernia Center Los Angeles today!